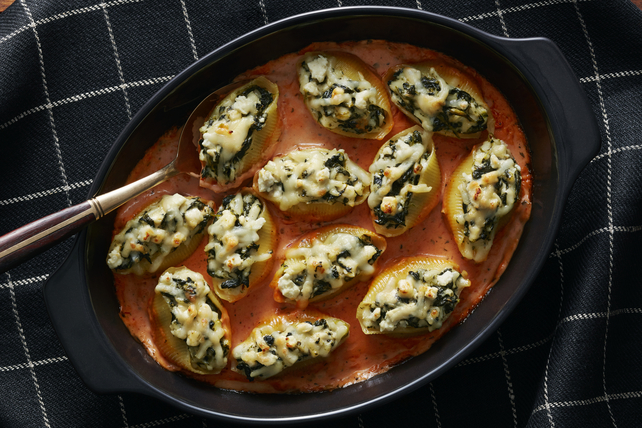 A blend of cheeses and spinach fill these delicious stuffed shells for a super-cheesy vegetarian pasta side dish that's sure to become a new family favourite. Cook pasta sauce, cream, Italian seasoning, garlic and 1 cup Miracle Whip in saucepan on medium heat 5 min. or until heated through, stirring frequently. Pour into shallow 2.5-L casserole dish sprayed with cooking spray. Combine spinach, cheeses and remaining Miracle Whip; spoon into pasta shells. Place in prepared baking dish. Serve pasta shells topped with pasta sauce mixture. Dried pasta will last almost indefinitely if stored in an airtight glass or plastic container in a cool dark place. When recipes call for thawed spinach to be "well drained," this means the excess liquid must be pressed or squeezed out. Use clean hands to squeeze out portions of the spinach or place the spinach in a sieve and press on it with the back of a large spoon.